Those French. When they're not making it difficult to order a croissant, they're busy populating the FCC with puntastic tablets. The French company Thomson and Technicolor's PoMMeS tablet (pommes, of course, being French for "apple") looks like a bad knock-off. According to the FCC description, the PoMMeS tablet measures 8-inches, with an 800 x 480 LCD touchscreen (complete with stylus), and VoIP video conferencing via the built-in webcam and speakers. 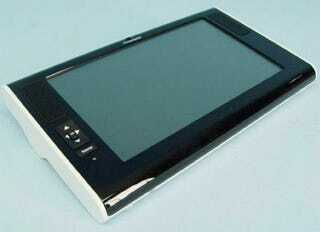 It'll be capable of streaming video no doubt, and doing the usual web browsing that's become standard for tablets.